I was contemplating performing an electrolysis cleaning of the fuel tank to remove rust from inside the tank and I even bought the necessary steel rod and Arm and Hammer Super Washing Soda to make my cleaning solution. Here is one of many links on the process if you want some more information, Tank Electrolysis. Once I had everything, I had second thoughts on performing this unknown process and potentially making things worse. The tank was in really good condition already for a 33 year old fuel tank. I then asked for some second opinions on the GS Resources forum and was told that it was fine as is, stop messing around, and just ride it. Tough love in this group. The previous owner had also indicated that he had a leaking issue at the fuel petcock and that he had replaced the gasket to address this, but I was still noticing some dampness around the petcock while the tank was sitting on my shelf even though the tank was pretty much dry this whole time so I went ahead and ordered a new OEM fuel petcock and the necessary gaskets to replace this. The fuel petcock was probably ok, but might as well install the brand new one in case anything else was wrong internally. This fuel petcock is vacuum operated in the Run and Reserve positions and there is no Off position, so if this feature is not working properly and there is any issue with the carburetor float valves you could potentially fill your engine with gasoline. Not fun. I then reinstalled the the tank onto the motorcycle frame and made my connections. I used all OEM fuel lines. Everything fits just right and doesn’t require hose clamps. Just like the fuel petcock screws, one thing I don’t like is fuel leaking on a hot engine that is sitting between my legs. No leaks and the fuel gauge works too. 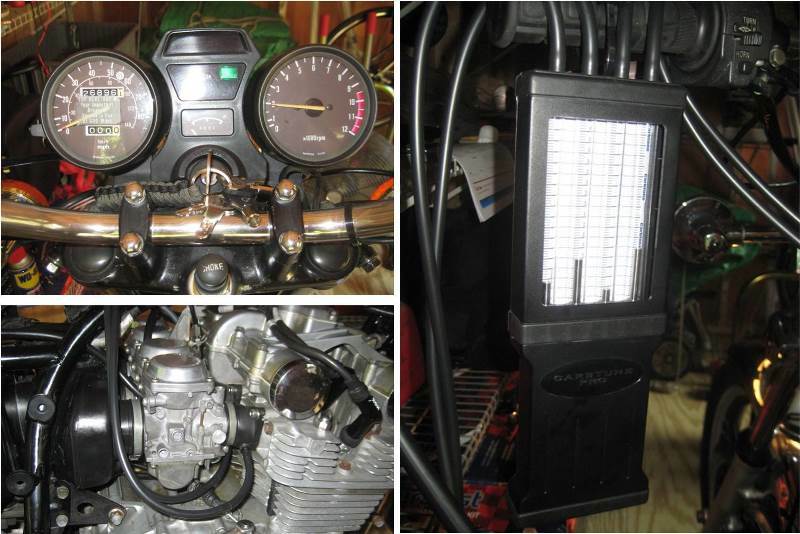 Once installed on the bike you will want to perform a vacuum synchronization of the carburetors to fine tune the balance of the four carburetors due to variations in each cylinder and how much fuel mixture they are able to pull in. Before getting to the vacuum synchronization though I warmed up the engine and performed an oil change. The bike will be running for a while in a stationary position and who knows when the oil was last changed. With the oil changed I setup a fan to blow air across the engine and rigged up my gauge for the vacuum synchronization. There are many different gauges that can be used to perform the vacuum synchronization. Many are in the form of liquid filled manometers or dial gauges. Each of these types need all four tubes or dial gauges to be calibrated against one of the carburetors before you can sychronize all four carburetors. 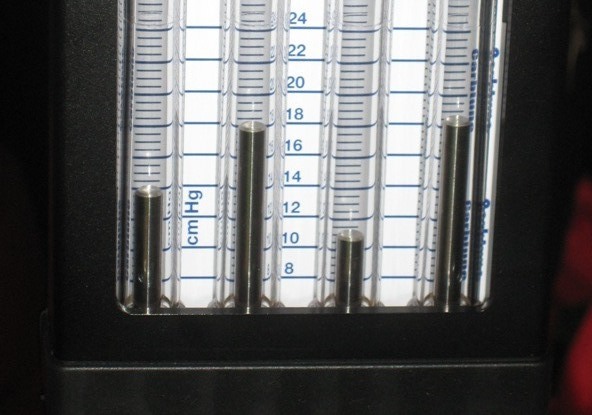 I used the Morgan Carbtune which is similar to the liquid filled manometer, but it uses metal rods instead of liquid and doesn’t need to be calibrated with each use. 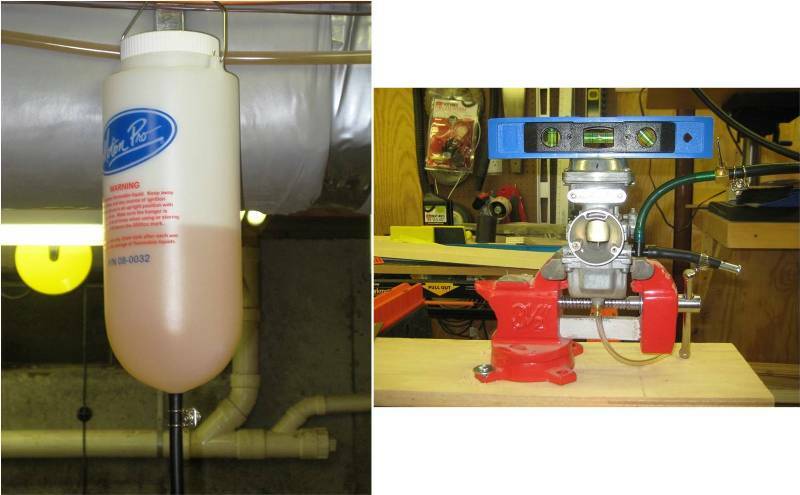 The following picture shows the setup for the vacuum synchronization. 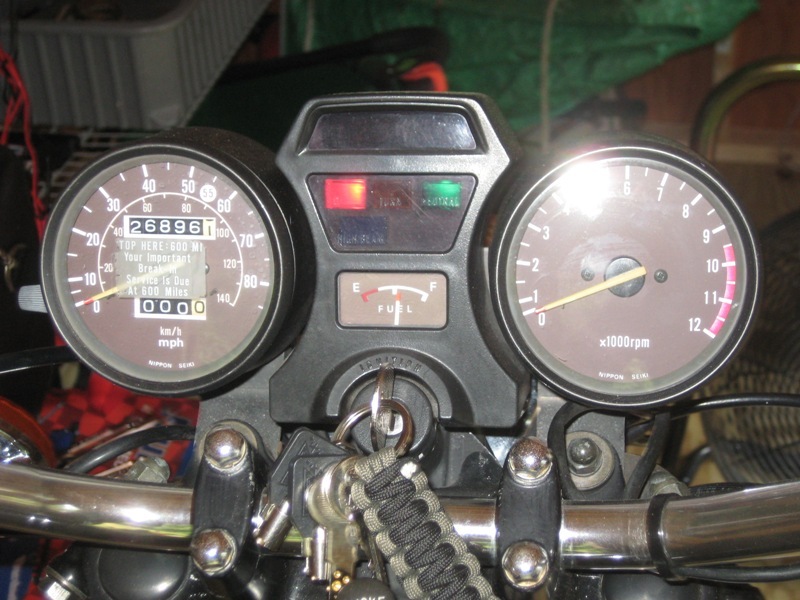 The Carbtune and four hoses are hanging from the left handlebar, the hoses are then connected to the associated vacuum port on the carburetor intake boots, the engine is running at ≈1,750 RPM, and a fan is running to cool the engine (not shown). The fuel tank is also removed and the engine running on the auxiliary fuel tank since it will be in the way when it is time to make the adjustments. Ignore the gauge readings for now and I’ll explain what happened next. 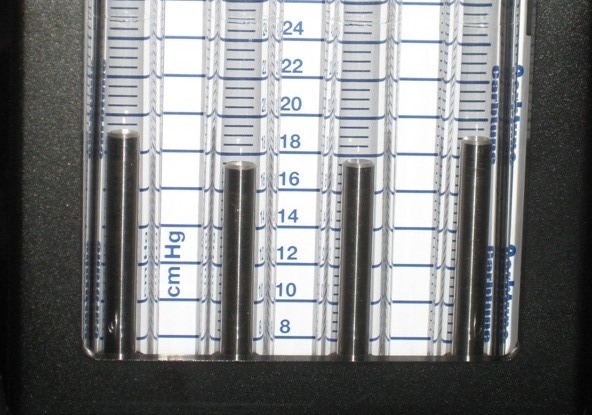 If using the liquid filled manometer, as shown in the service manual, a correctly adjusted carburetor has the steel balls in tubes 1 and 4 at the same level and those in tubes 2 and 3 also at the same level, but lower by one half ball diameter compared to tubes 1 and 4. It has been determined that this half ball difference is ≈2cm Hg difference in vacuum pressure. As you can see in the photo above, my carburetors are no where near the proper adjustment. This could mean that I did a terrible job with the bench sync of the carburetors, but it is actually due to trying to synchronize the carburetors without cylinders 2 and 4 running properly. Once the engine was running properly it completely changed how much vacuum cylinders 2 and 4 were pulling as compared to cylinders 1 and 3. So now it is time to adjust the throttle valve openings to balance the four carburetors. I purchased another special tool from Morgan that they call the Carbtool. This tool is the combination of an 11″ screwdriver and an 8mm socket wrench that will allow you tighten/loosen the lock nut and turn the adjuster screw in a tight space between the cylinder head, carburetors, and frame. There are three adjusting screws. 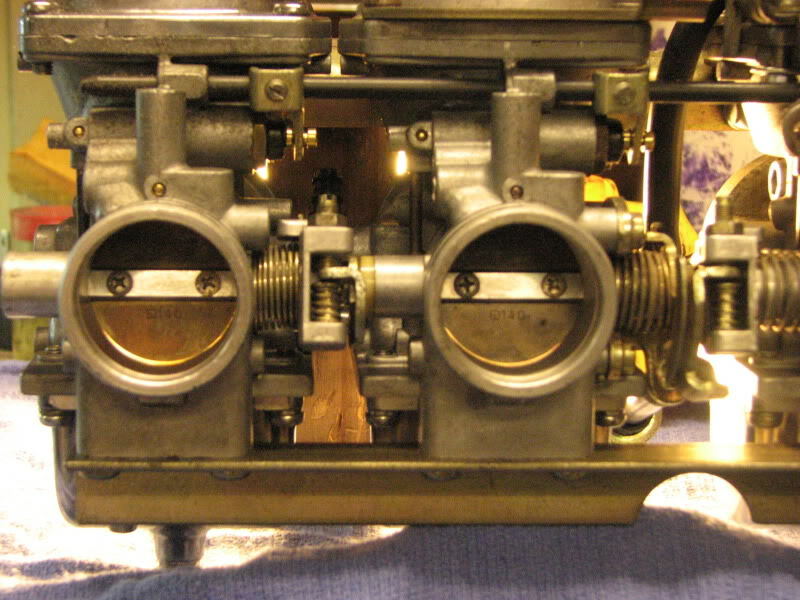 One as shown above between carburetors 1 and 2. The other two are between carburetors 2 – 3 and carburetors 3 – 4. Carburetor number 3’s throttle valve is adjusted by the idle control knob. 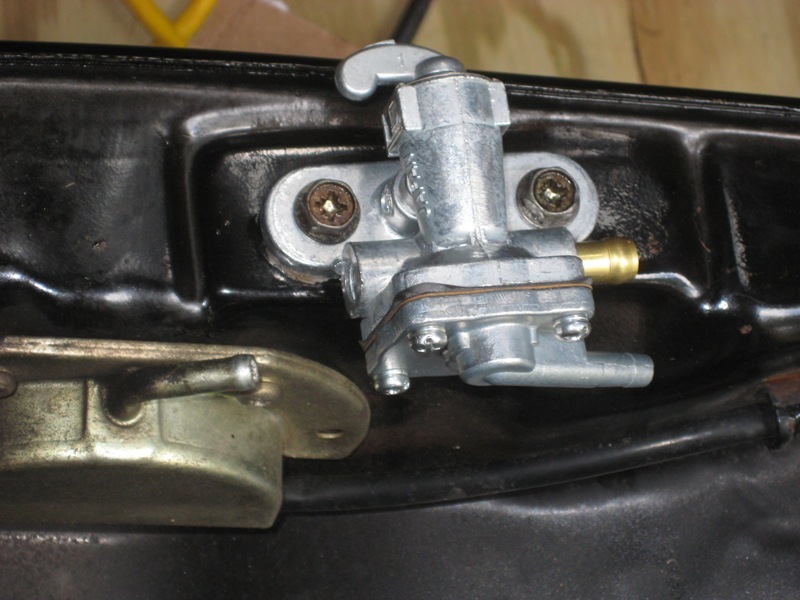 The adjusting screw between carburetors 2 and 3 is blocked by the choke cable bracket, so once the engine is warmed up, this bracket needs to be temporarily removed. 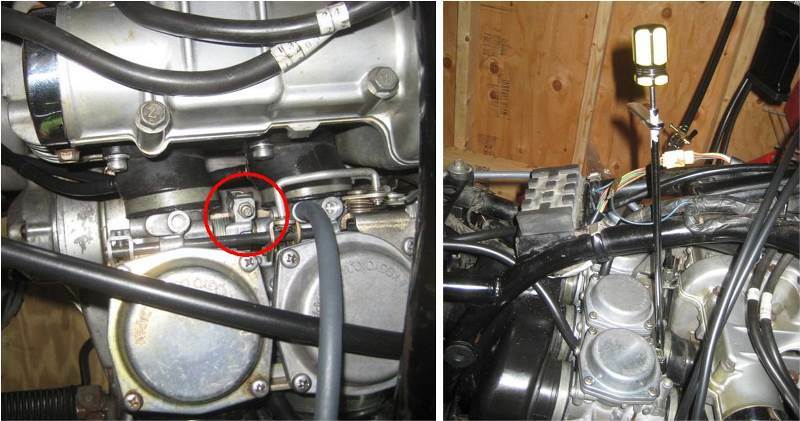 The adjusting order is to synchronize carburetor 2 to carburetor 3, then adjust carburetor 1 to be a little higher than carburetor 2, and then adjust carburetor 4 to match carburetor 1. It might take some back and forth since each adjustment can affect the previous adjustments. After completing the adjustment, set the idle back to 1,100 RPM and remove all of the test equipment. Next step will be to clean and inspect the fuel tank to be able to get it reinstalled and get closer to a first ride. 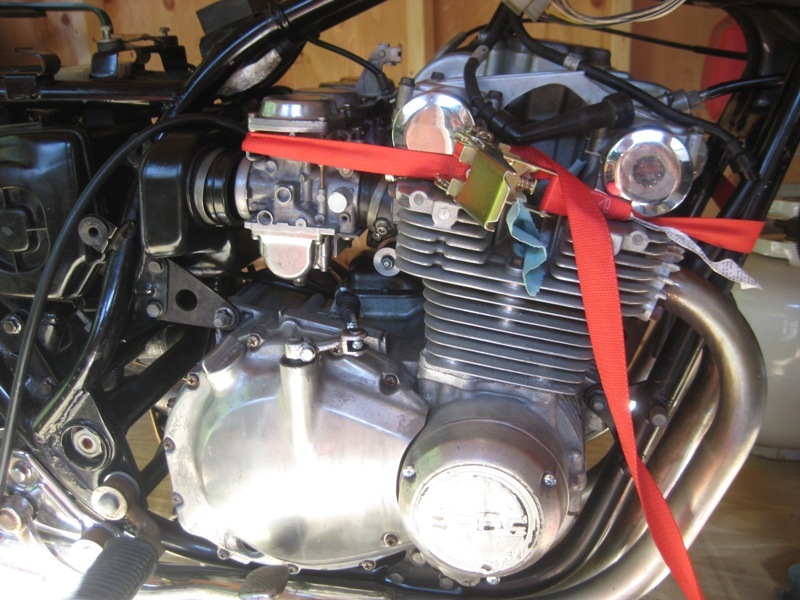 I recently completed the carburetor rebuilding, intake o-ring replacement, and bench synced the four carburetors so that they will be opening an equal amount when I attempt to start the bike for the first time. Now it it is time to start putting some parts back on the bike. 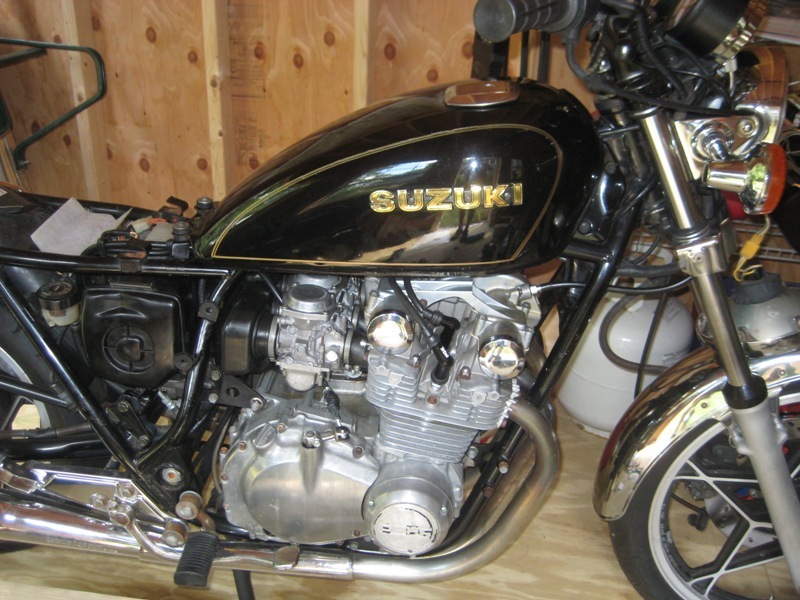 Namely the clutch cable, air box, and carburetors. First was the clutch cable while there was still plenty of room to work. The previous owner had already removed the clutch cable and had provided a cable in the parts box for the replacement. He had indicated that the cable was needing to be replaced due to stretching. When I routed the new cable and attempted to connect it to the clutch actuator arm, it wasn’t even close. I don’t believe the cable could have stretched that far. Here is a before photo on the left and the after photo on the right. The position that the clutch actuator arm is in now is correct and is a much better alignment to achieve the most mechanical advantage with the cable pull being 90° to the arm. Install the air cleaner box into the rear of the frame through the middle of the frame without the cover on the box. Don’t screw it into the frame yet. Insert the air chamber into the air cleaner box. These two pieces will slide back and forth a bit to provide room to get the carburetors in, but movement is limited by the frame that is between these two components. Dielectric tune-up grease was added to the inside of the intake boots to help the insertion and improve the vacuum seal. 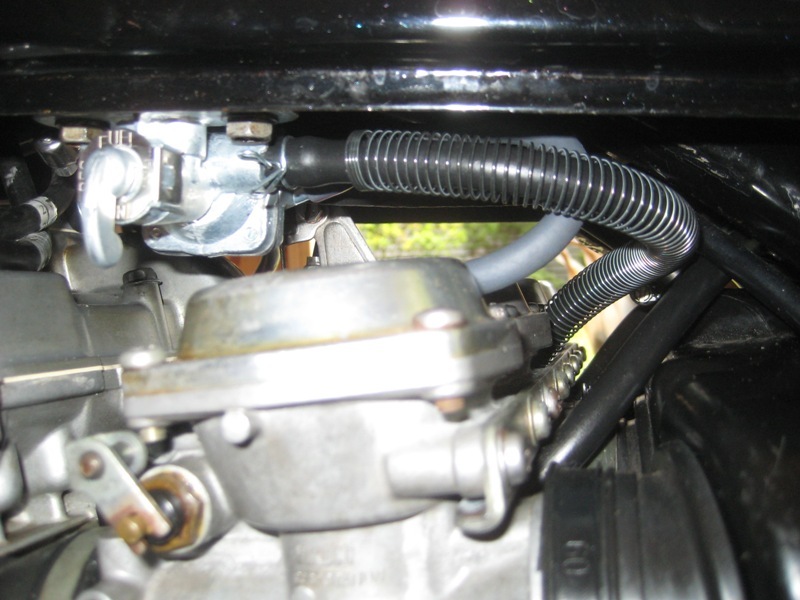 Have all of your hoses for fuel, vacuum, and vent connected to the carburetors. No way you will get these in later. 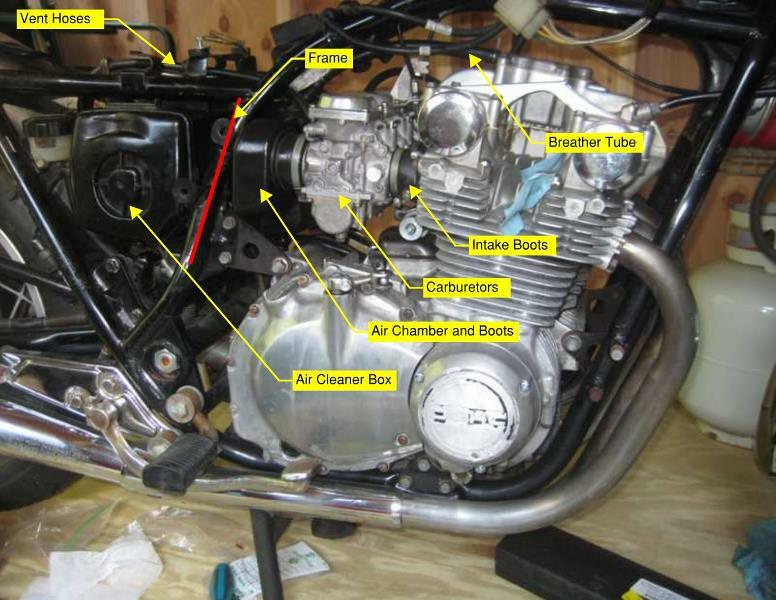 As you are sliding the carburetors in from the side of the bike, connect the choke and throttle cables to the front of the carburetor between carburetors no. 2 and 3. Squeeze the carburetors in between the boots from the air chamber and intake boots on the block. Once you are lined up between all of the boots, get the carburetors into the intake boots first. I needed a third hand helper of a strap clamp to keep things aligned and squeeze the carburetors into the boots. Tighten the intake boot clamps. Slide the air chamber boots onto the backs of the carburetors. Tighten the boot clamps. Screw in the air cleaner box and install the air filter and cover. Mount the regulator/rectifier to the bottom of the air cleaner box with ground wire to the battery box. 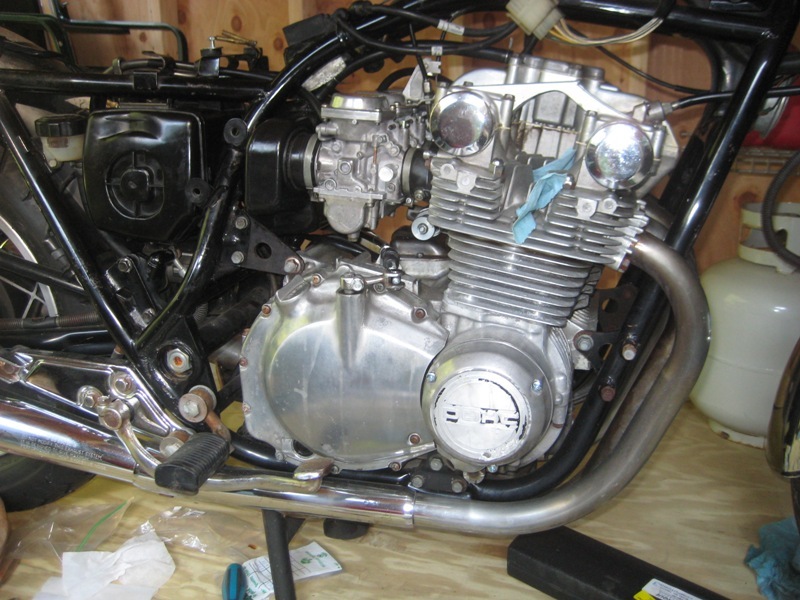 Connect the breather hose between the air chamber and the cylinder head. I should have put the hose on the air chamber before installing the chamber into the frame. I couldn’t get the spring clip on after the fact and resorted to a traditional hose clamp instead. Route the two vent hoses to the rear of the bike in front of the rear wheel. The fuel and vacuum hoses will be completed when the fuel tank is reinstalled. I think that was it. Pretty hot and tired after that effort. Photo of everything going together with the strap clamp helping me out. And maybe one more trying to clarify all of the different pieces that were crammed into a tight space. I have been continuing with the cleaning and rebuilding of the four carburetors. A slow going process mainly due to the soaking time required for each carburetor to get all of the carburetor passages clear before rebuilding each carburetor and only space in my parts cleaning bucket for one carburetor at a time (Don’t want to swap parts between carburetors either). Now all four carburetors are cleaned, o-rings replaced, gaskets replaced, rebuilt, and float tested. The carburetors were already removed from the bike when I bought it, so everything I do I am looking for clues to what might have been the issues before the previous owner stopped riding this bike, but some of the things that I am seeing could just be because the bike has not been run for a few years. 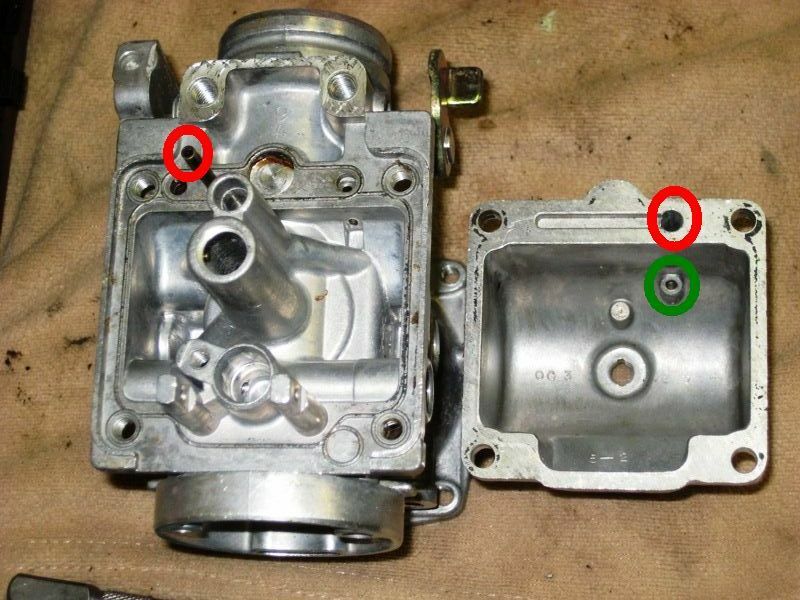 All carburetors had the float valve plunger (red circle in photo) sticking and pilot jet orifice (green circle in photo) clogged. The plunger is spring loaded and took long soaks and carb cleaner spray to free them up. Not sure this would have had much effect on the running of the engine, but the float valve in carburetor four was completely stuck in its valve seat. Either no fuel was getting into that carburetor or it would never stop filling up. The clogged pilot jets would have been affecting the the low speed range of the engine. All four carburetors also had the starter circuit or choke circuit completely clogged. Therefore the bike was probably hard to start without being able to richen the fuel mixture. This circuit is shown in the following picture. 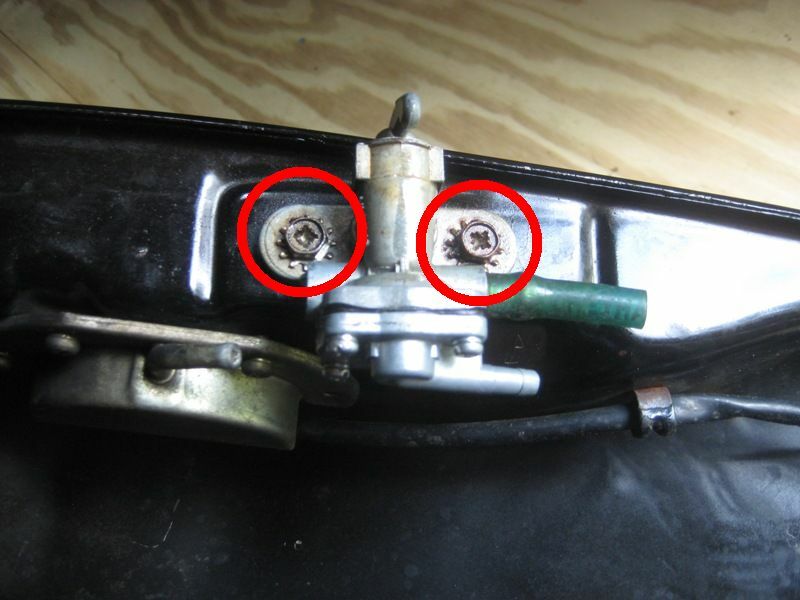 The red circled fuel pickup on the left inserts into the red circled passage on the float bowl body on the right. The float bowl then has a passage way between the red and green circles to pick up extra fuel when the choke is engaged. Lots of soaking, carb cleaner, and poking with a wire to get these passages reopened. The last item during the tear down was removing the piston slides of the diaphragms. 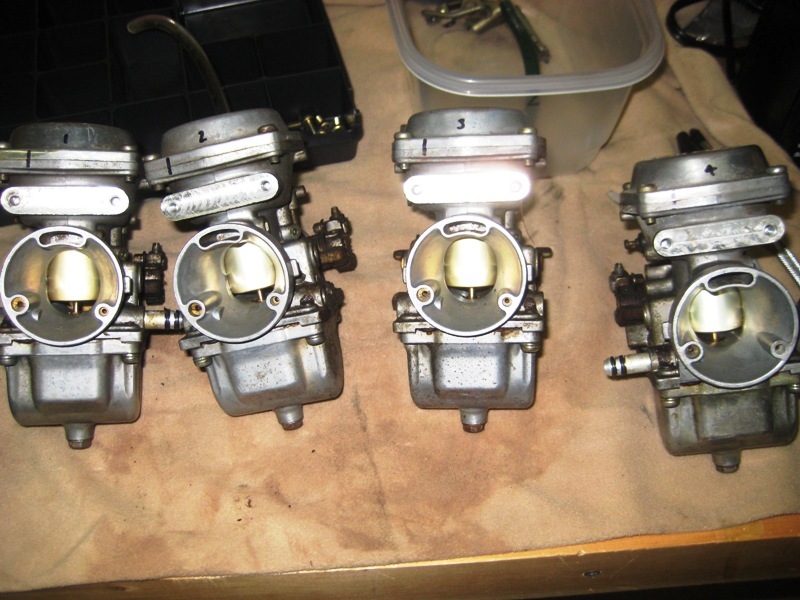 The picture below is an early shot of the four carburetors before the tear down. The piston slides are the gold tubes in each carburetor. Carburetors one thru three were just a little tight to remove. A gently pry with the wooden handle of paint brush popped them right out. Carburetor four was really stuck again though. The wooden handle of the paint brush broke on the first attempts. A day of carburetor cleaner spraying and gently prying with a plastic handled paintbrush got that diaphragm out. Again, a fuel mixture/volume issue with this carburetor. After soaking the carburetor bodies in parts cleaner, all four diaphragms move up with just light finger pressure and return to seated on their own with the proper motion. When putting each carburetor back together, most everything just gets tightened until fully seated. One of the items to adjust is the float bowl height. The photo below shows a before adjustment picture on the left and after adjustment picture on the right. 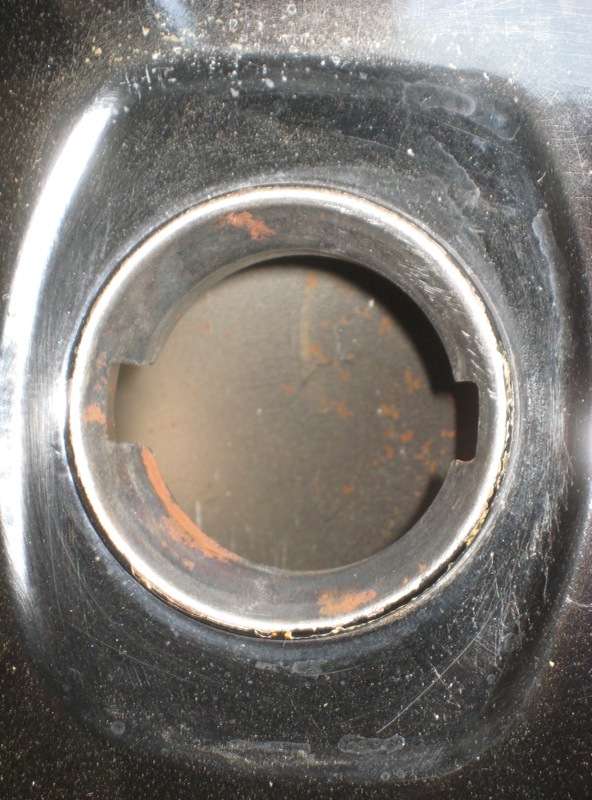 The specification is 22.4mm +/- 1mm for the float height measured from the gasket seat. All floats measure low and were adjusted with an imprecise method of bending the metal tang of the float bowl arm that presses against the plunger of the float valve shown above. 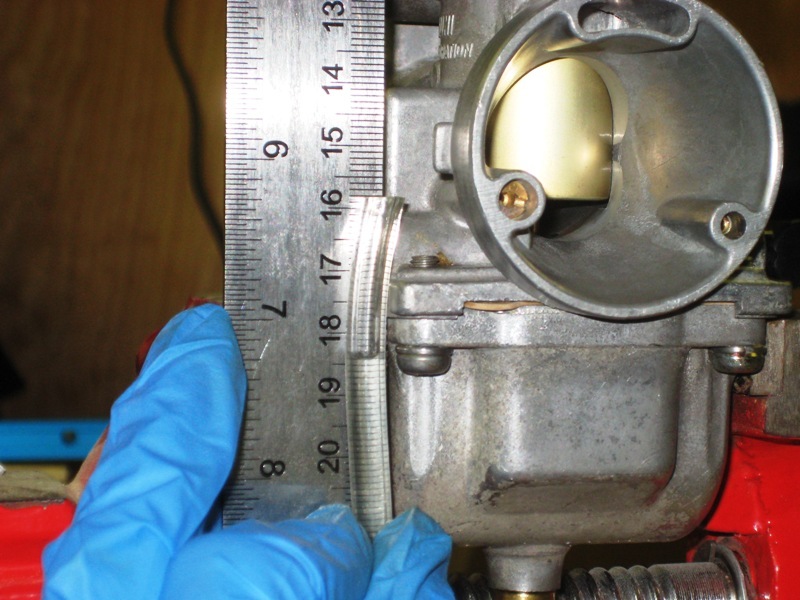 The carburetor are upside down during this measurement, so if the float position is low, the fuel level in the bowl will actually be higher than desired. Running rich again and possibly flooding with how low these floats appear to have been set. At this point, all four carburetors are back together. The last item adjusted on each carburetor, but not shown here was the pilot screw on each carburetor. For these, I screwed the pilot screw in until lightly seated and then backed them out 2.5 turns as a starting point for the idle mixture. 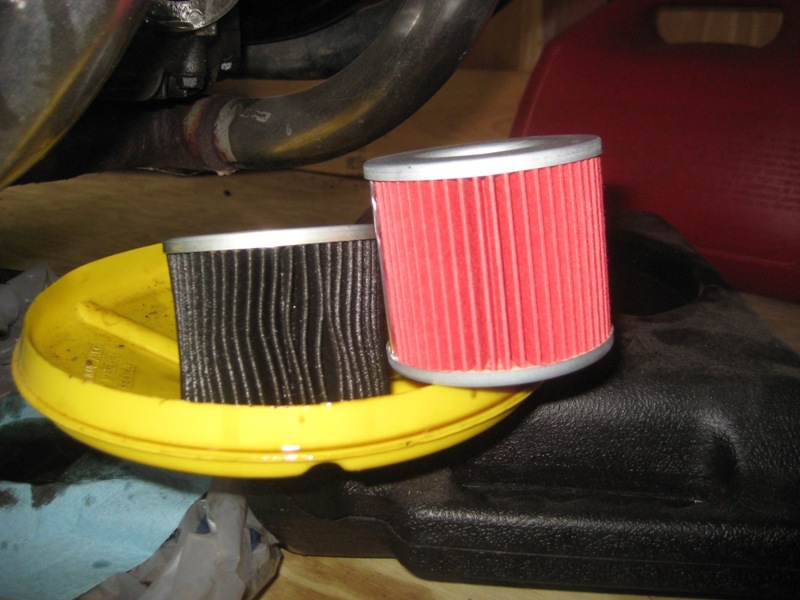 This will get adjusted again on each carburetor once the carburetors are installed, engine running, and carburetors vacuum balanced. 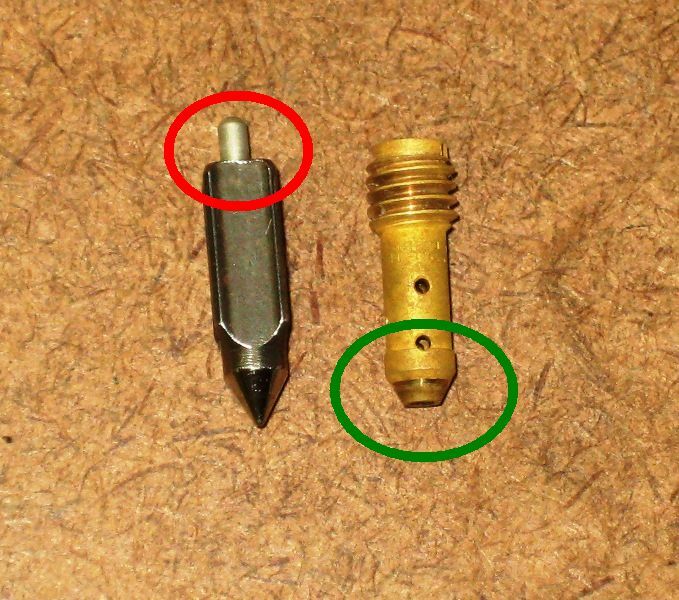 Although the floats were adjusted to specification above, it is much better to actually test the fuel in the float bowl by attaching a clear piece of tubing in place of the float bowl drain plug (service manual does this test with the engine running). In this test, you are looking for the fuel level to be 5mm +/- 1mm below the bottom edge of the carburetor body. Here is the test setup with an auxiliary fuel tank and the carburetor leveled in a vice. There is only about 1/4 gallon of fuel in the tank, but it was hanging from the ceiling to get some head on the fuel line which will also make sure your float valves are working properly. Surprisingly, even though I raised the height of each float before putting the carburetors back together, the floats were still too low. One more round of adjustments and each carburetor is right on 5mm below the carburetor body. Gang the carburetors back together. Bench synchronize the four carburetors. Remove the intake boots from the cylinder head and replace their o-rings. Carburetor #1 vs. Carburetor #4 after dipping in Berryman’s Chem-Dip Carb Cleaner for 2 hours. Small parts and jets to be done next.